West of SFBFS’ Family Services campus in Oak Park is a flourishing garden, abundant with flowers and vegetables. Along with the blooms, rows of celery and lettuce are thriving despite the recent heavy downpour of rains. SFBFS’ garden provides opportunities to learn about gardening, composting, pest management, healthy food choices and irrigation systems. It also offers a supply of delicious vegetables. Celery and lettuce, for example, are staples in many important vegetable cookbooks. 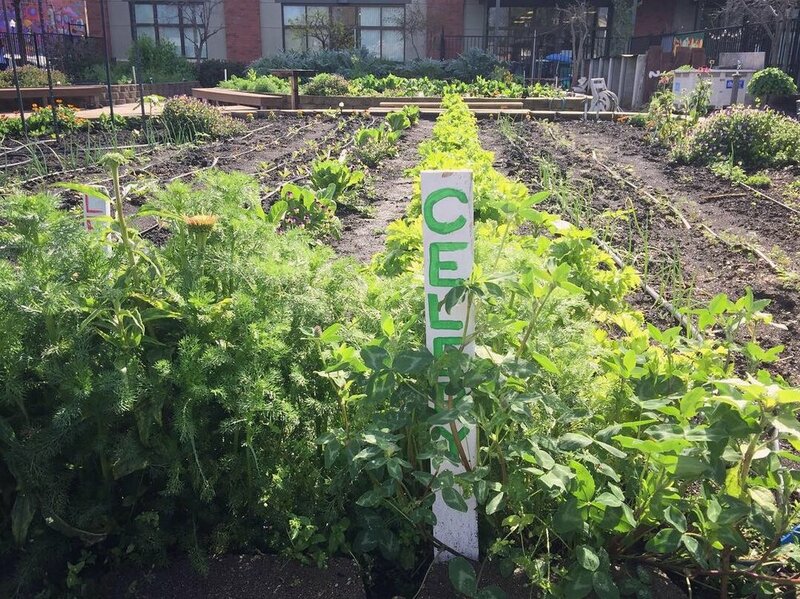 Bright green rows of celery and lettuce extend down the center of the thriving Family Services garden. Both of these plants are staples of many creative tables, including that of my sister who suggested a stuffed lettuce recipe. The following simple concoction utilizes various minced vegetables mixed with a blend of cream cheese and, if desired, sour cream. Whatever legumes are preferred, once finely chopped and mixed, the tasty compound is stuffed in the middle of a large, hollowed-out head of iceberg lettuce which then is chilled for up to 6 hours. Other minced vegetables and Worcestershire sauce can be added for extra flavor. The center core of the lettuce is hollowed to provide room for the mixture. Once chilled the prepared head of lettuce is cut crosswise, serving 5 or 6. SFBFS’ Demonstration Garden includes a greenhouse, composting and vermicomposting bins, large production beds along with other demonstration areas and an outdoor kitchen table where clients can learn to prepare food they cultivate and harvest. For more information, e-mail SFBFS’ Garden Coordinator or call (916) 456-1980.